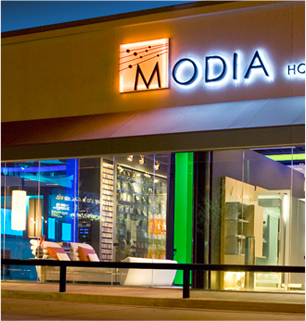 For almost 3 decades, MODIA has been the retail connoisseur for consumer electronic products in Texas. Founded & led by Mihir Mody, based out of Houston, Dallas & Austin, the business has garnered over half a million of loyal customers who swear by the MODIA brand of luxury products and exclusive white glove service. At MODIA, living well isn’t about how much we spend on the things we enjoy it’s about how much we actually enjoy them. And believe it or not, there’s as much emotion as art in that equation. Our passion is to use our ingenuity, patented installation solutions, proprietary media furniture and extraordinary audio products to create the kind of smart, comfortable and stunning living space that aesthetically matches the decor in a home and enriches the lives of our clients. We are among the most recognized retailers in the country. MODIA was awarded the #1 Custom Retailer award in electronics and since then it has retained its position among the top five independent custom retailers in North America. MODIA has been recognized among the top 100 firms for the highest retail electronics revenue in the country multiple times in the last decade including 2013. 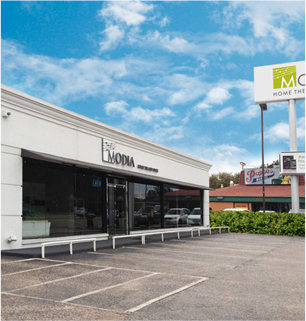 Most recently MODIA was awarded the Retail Excellence Award by DealerScope magazine in August 2014, which was an encore from 2012 awarded by TWICE magazine. Much has been written by our customers about us, some of who are celebrities. To us however, each and every one of our customers is treated like a celebrity. Your experience at MODIA transcends the products we sell, it finds its niche in the ambience & meticulous attention with which we wait upon you, even as you explore your most wanted Electronic desires in the store. This is indeed a music lovers paradise, an entertainment haven for the ones who reach high into the galaxy of multi starred plethora of brand names such as Bowers & Wilkins, McIntosh, Classe, Rotel, Yamaha, to name a few. We know that it’s not enough to just carry exclusive products - we are also in business of educating the clients by delivering the solutions they would never think to ask for. A unique aspect of patronizing us is that we are your one stop shop for exclusive A/V furniture, designed and produced by MODIA. We make sure that the products fit in with the clean lines of your own aesthetics and interior decoration, with the minimum amount of clutter so they actually show off your space better and look like exquisite decorations to your already fine home. We offer clever component storage solutions to fully motorized lifts and innovative wall mounts… for a truly panoramic landscape. We are a critical resource for designers, architects and custom homebuilders to explore and find the perfect aesthetic solution for custom needs in the same manner one would go to a decorative center to select fabrics or furniture. The MODIA brand of service: What’s different? 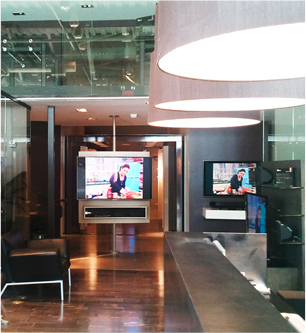 Come, let’s give you a quick inside tour of the MODIA experience. We pride ourselves on going above and beyond for you, in all our techniques, tools and methods compared to any to other retailer in the market. These are indeed a mark of the MODIA brand of service. When we demonstrate the sound you hear, we do it in acoustically treated rooms with reflectors, absorbers and diffusers that wipe out all trace of sound impurity. Our speakers are connected to separate amplifiers and processors to enable a pure sublime, laser sharp sound experience vs. receivers as demonstrated at other retailers. When you want to compare sounds, we demonstrate old school techniques like analog patch panel switching that guarantees a distinctive sound instead of normal digital switching that loses sound quality and signal. Unlike others, our Audio demo rooms include old- fashioned vinyls and newest lossless CD quality through high resolution audio player. We have several hundreds of your favorite tracks on iPad so you can listen to the one that works for your special brand of magic. Still not comfortable? Take the products home and try it in the familiarity of your home. Have the MODIA luxury experience, on us! We are in the business of making “customers for life”. We invest in a multi-generational relationship with you and your family. Your products like any other investment appreciate in value since they are hand built with antique components. 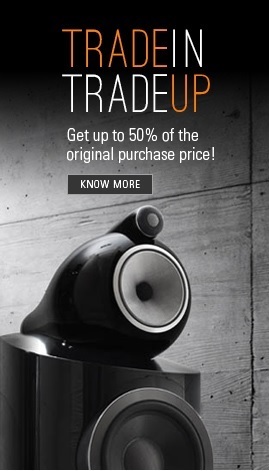 Hence you will be able to upgrade your select luxury brands products such as Bowers &Wilkins Nautilus Loud Speakers and McIntosh amplifiers and processors, years after you have purchased it from us for a trade exchange unheard of in retail circles. You will get your investment back and get new technology. All of this for the same price! Just because you are our customer! Our customers are treated with good old fashioned indulgence that pampers your senses and spoils you for any other retail experience. These distinguish MODIA from every other retailer… These are not entitlements, simply our assertions to the ultimate personalization and private brand experiences, that MODIA has stayed true to in its continuing tradition of offering custom-made services, tailored to You, our privileged customer. The eyes cannot hear what the ears do….. Listen to the sound that transcends the senses and picture that goes beyond perception. Walk into MODIA. An inviting cozy setting for having an afternoon chat about “your favorite things” with our sales executives over a cup of espresso with freshly baked cookies, or an adventurous evening shopping experience over a glass of your favorite wine…. Whatever you are in the mood for, we will escalate the experience and make it your favorite place to be! If our customers have something to say: a suggestion, a request, a concern, a compliment I want to know. My e-mail address is mihir@modia.com. And I put it out there because our customers are who keep us out in front. 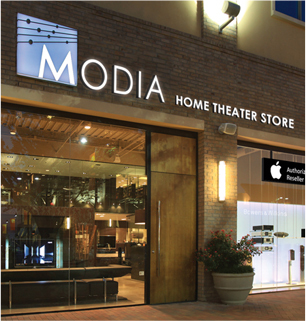 Come to MODIA - You will have arrived to your ultimate destination for a lifetime of consumer electronic experience. Your music. Served fresh daily. Your theater. Privately owned. Publicly envied.